Assassination in Lesotho: Blood On SADC’s Hands, Too | Jordan Ink. « Time to Ask: Who Lost Lesotho’s Democracy? The seeds of crisis, ironically, were planted by the landmark 2012 elections that peacefully ended Mosisili’s 14-year run as Prime Minister, then creation of one of Africa’s rare coalition governments. Tom Thabane became the first premier to crusade against corruption – though, he seemed to snare only those close to Mosisili. With corruption accusations mounting, in January 2014, grenades were thrown at the homes of Thabane’s girlfriend and national police chief Khothatso Tšooana, whose agency leads the corruption investigations. The grenade attacks were blamed on Kamoli’s LDF – specifically, the soldier-bodyguards protecting Deputy Prime Minister Mothetjoa Metsing, who also stood accused of corruption. Kamoli, whom Mosisili had appointed as military chief near the end of his rule, reportedly refused to cooperate with the investigation. On 29 August, Thabane fired him for insubordination, replacing him with Mahao. The next morning, Kamoli launched a simultaneous assault on Thabane – forcing him to flee into South Africa, five minutes away – and on the police headquarters, purportedly in search of corruption files. LDF troops killed one police officer, injuring nine others. Later, Mahao’s home was reportedly also attacked, with his dog killed. Enter SADC, the regional peace-and-security bloc, to “mediate” the crisis. 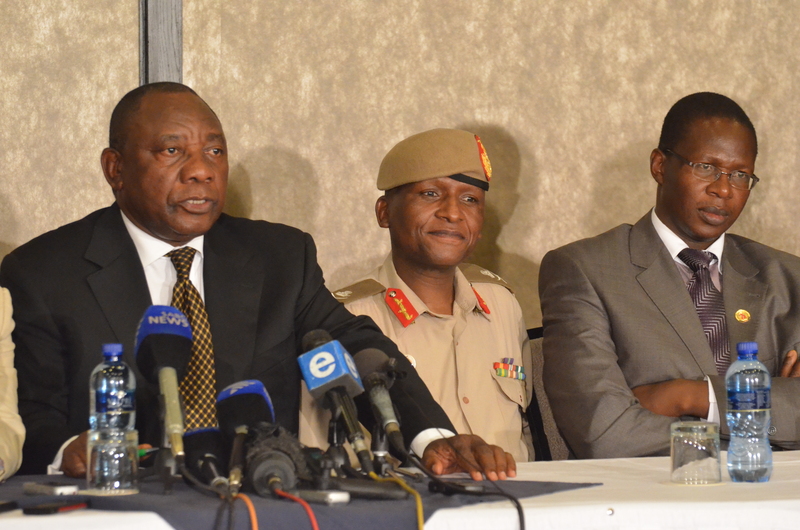 As SADC mediator, Ramaphosa pushed a two-pronged solution: move up elections more than two years early, for a snap ballot on 28 February, and exile from the Lesotho the three security chiefs – Kamoli, Mahao and Tšooana. Ramaphosa, though, dressed it up as a “temporary leave of absence” – of undetermined length of time. Crucially, not once during months of mediating did Ramaphosa mention the corruption and political violence at the heart of the crisis. Nor did he ever address what unfolded on 30 August: who did what to whom – and why. Even at the time, it suggested a certain bias, as that inquiry would presumably reflect poorly on Thabane’s chief rivals: Mosisili, Metsing, Kamoli. Meanwhile, a Lesotho police probe into the “treason” and “murder” carried out that day fizzled due to non-cooperation. Mosisili, unsurprisingly, won the 28 February elections, then formed an unwieldy seven-party coalition, with a majority of one. SADC congratulated itself for a job well done – and hastily pulled out. Then the red flags emerged, one by one. Most alarming, Mosisili brazenly announced that he’d re-instate Kamoli as military chief. Mahao was demoted; Tšooana, accused of corruption and ousted. More silence from SADC, particularly Ramaphosa. Would Mosisili have dared bring back Kamoli if heavyweights like Mugabe, Zuma and Ramaphosa were opposed? Implausible, I think. With Kamoli back in charge, what’s ensued is a mini-reign of terror aimed at enemies – and to strike fear in the hearts of ordinary Basotho: Watch out, because no one is untouchable. In a country brimming with unsubstantiated claims – yet too intimidating a climate in which to demand answers or point fingers – no one knows exactly what’s going on. Except perhaps for the plotters and perpetrators. The first blow was the shooting death of Thabiso Tšosane, a prominent businessman and purported financier of Thabane’s ABC party. Even Lesotho’s King Letsie III spoke at his funeral. Thabane then fled to South Africa for a second time, joined by two other opposition leaders – all three claiming murder plots. A slew of soldiers purportedly loyal to the former commander-in-chief, Thabane – thus, disloyal to Kamoli – were “kidnapped,” allegedly tortured, accused of “mutiny,” some trundled into court limping or in leg-irons, their lawyers threatened. Headlines like ‘Tortured’ Colonel Bleeds in Court have grown common. More SADC silence, except for one May 26 Tweet: DP Ramaphosa says SA remains ready to assist people of Lesotho for everlasting peace and security. Is Kamoli’s LDF still rebelliously untamed, as it appeared under Thabane’s rule? Then SADC is culpable for not addressing that. Or, are Kamoli and his LDF “tamed,” in fact – with Mosisili, Metsing and others, giving the thumbs-up? Coupled with SADC’s deafening silence, how can we interpret this as anything less than a carte blanche to the new Basotho leadership? As in: Clamp down, clean up the mess, and keep pouring your precious Maluti mountain water into our thirsty country. Amid the lawlessness, the US Embassy in Maseru has become Lesotho’s first international partner to flex its muscles. In late May, US Ambassador Matthew Harrington told local journalists that a large new donation may be withheld from Lesotho unless someone his held accountable for last 30 August – and the killed cop. How significant is that? According to the Embassy, since 2007, the US has given Lesotho $225 million through its PEPFAR programme – specifically to combat HIV. Moreover, from 2008 to 2013, the Millennium Challenge Corporation (MCC) donated a “Compact” of $362.55 million toward health, water and private-sector development projects – much of it spent to build or renovate 138 health clinics, a mind-boggling number in rugged, sparsely populated Lesotho. From those two programmes alone, over eight years, US taxpayers have given nearly $600 million to a tiny African nation that few have even heard of. That makes them more than major donors, but major investors, as well. What have they got in return? The rate of HIV infection hasn’t budged from 23 percent in more than a decade. When I arrived here in late 2011, UNAIDS and others consistently ranked Lesotho as suffering the world’s third-highest rate of infection – behind Swaziland and Botswana. Last year, though, UNAIDS elevated Lesotho from third to second. Not because Lesotho’s rate had risen, but because Botswana’s leaders have taken serious steps to tackle the epidemic. The HIV story gets worse. At a December conference in Maseru on HIV orphans, HIV activists noted the great strides Swaziland and Botswana have made to prevent new infections. Lesotho lags far behind. By my reasoning, if the world’s No. 1- and No. 3-ranked countries are improving, but the No. 2-ranked country is not, one can argue: No leaders in the world are doing worse in fighting HIV than Lesotho’s. The worst in the world! Basotho leaders should be ashamed. Instead, over the past year, certain elites have committed fresh crimes to conceal old crimes – not just ignoring the plight of their people, but paralysing many donor-funded programmes aimed to help them. Against this backdrop, Washington has drawn a line in the sand. To be fair to Harrington, he only arrived in Lesotho in October, new to this highly complex crisis. Besides, SADC was already “on the case”: African solutions to African problems. So, the US Embassy largely kept quiet, too – apparently, taking a wait-and-see approach. Government officials and Mosisili loyalists respond by claiming these as internal affairs, and the US should keep its nose out of it. But by all means, please do keep those donor-dollars flowing! (Conspicuously, though, they always dodge the central U.S. point: accountability for Aug. 30.) Mosisili himself, on the sidelines of that AU summit a fortnight ago, flat-out denied any instability – with a straight face. Would Mosisili risk financial aid, perhaps even factory jobs, sanctions and isolation – to save Kamoli? That’s the $64,000 question. Why would he? One Lesotho police investigator has referred me to the year 2007, from which the cops still have 27 open, unresolved cases of political violence, against then-dissident Thabane and his supporters. Mosisili was the Prime Minister. His LDF military-intelligence chief? Kamoli. So, Kamoli may be the thread who unravels so much mischief in Lesotho. How much will ordinary Basotho tolerate? Fed up, a cowed civil society is finally finding its voice. And for the first time, a petition has bravely appeared online. In defense of Basotho who yearn for accountability, whether Washington backs up its tough words with MCC action, or more, remains to be seen.